Home of Empire Rabbitry. Stop in to hear about our animals, knitting and spinning projects, and Gluten Free Living. I've been working off and on with 2lbs of a 75% Coopworth wool, 25% Bombyx silk roving, and it was dragging on and on. I finally got over my motivation issues with it and finished up the lot, yielding an estimated 1200 yards of worsted to heavy worsted, 2 ply yarn. It was spun in the supported long draw style, which worked well with the fiber. I think I'll knit a nice beefy and heavily textured coat style cardigan with it, perhaps cables, but we'll see what actually happens when I actually start working with it. Almost as soon as the wool/silk was off the wheel, I started working on this Creatively Dyed 50% Merino, 50% Bamboo braid (4oz) that I bought a few years ago at a fiber festival. 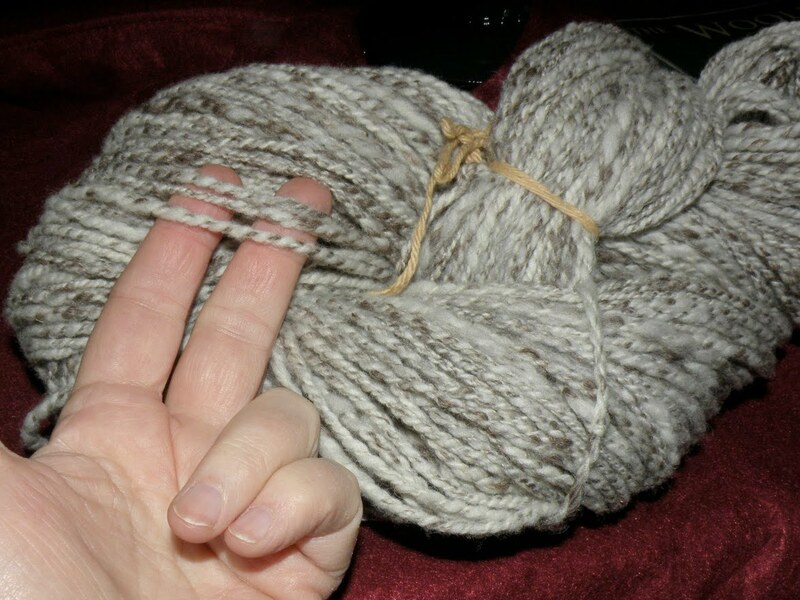 I've shown here for you photos of the fiber, the singles on the wheel, and the finished and washed yarn. I chose to spin at a higher ratio with the single looped across the flier arm to reduce draw in rate and increase twist in order to reduce the grist of the single. The fiber was split in half-ish, spun on seperate bobbins, and the two plied together. I obviously either didn't split it right or the singles overall were not the same and also seems some of the color blocks do not go all the way through the roving section, so there was variation in the plied yarn and the colors did not match up perfectly. However, I am very pleased with the overall result. There is a large section of green, and the rest of the yardage is varying shades of copper, warm yellows, peach and a touch of purple. It is approximately fingerling weight. 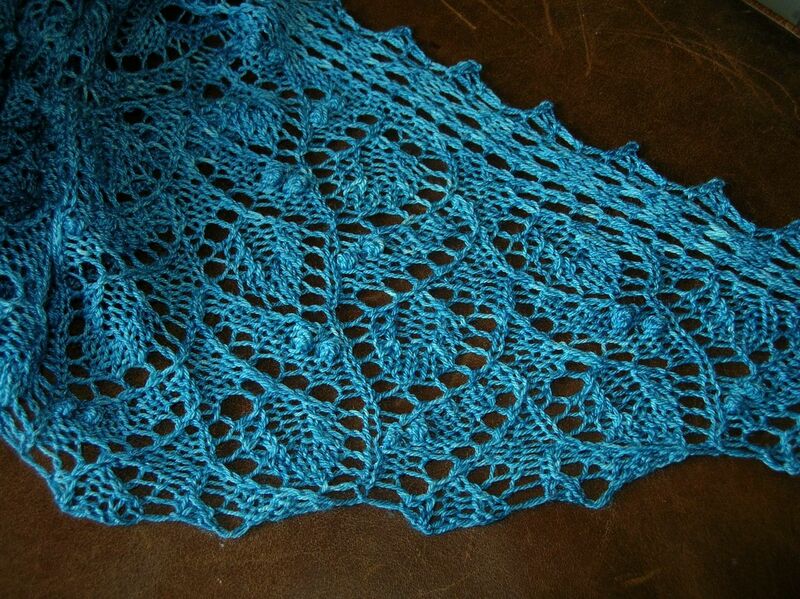 At the moment, I'm planning to knit the Ginkgo Shoulderette Shawl by Fragrant Heart Creations. Heat oven to 350*F, as directed by the mix package. Put paper liners into muffin pan (I prefer a stoneware pan for nice, even baking). Chop or grind pecans to taste. I usually pound them into powder, but if you prefer chunks, that's fine too. Set aside. Soften cream cheese, butter, and coconut oil briefly in microwave, but be careful to not overheat them or they'll cook your eggs. Mash up then whip with the eggs. Add cake mix and pecans gradually, mixing after each addition. Add chocolate chips and/or dried cranberries, as desired, and mix. Portion into miffin/cupcake tins. I usually fill about 3/4 full or so. 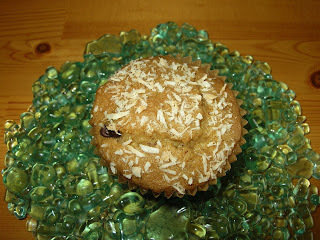 Sprinkle coconut on top. Bake 20-25 min until a toothpick comes out clean. Remove from pans and cool muffins until cool enough to eat without burning your tongue. Enjoy. Soften cream cheese in microwave, mash it up then whip with the eggs, pumpkin, and molasses. Add spice cake mix gradually, mixing after each addition. It will be thick. Resist the temptation to add additional liquids. Portion into miffin/cupcake tins. I usually fill about 3/4 full or so. Bake 25-30 min until a toothpick comes out clean. 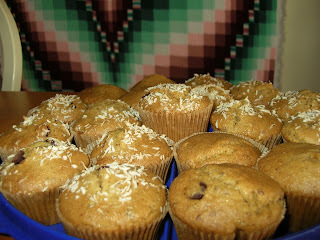 Remove from pans and cool muffins until cool enough to eat without burning your tongue. Enjoy. 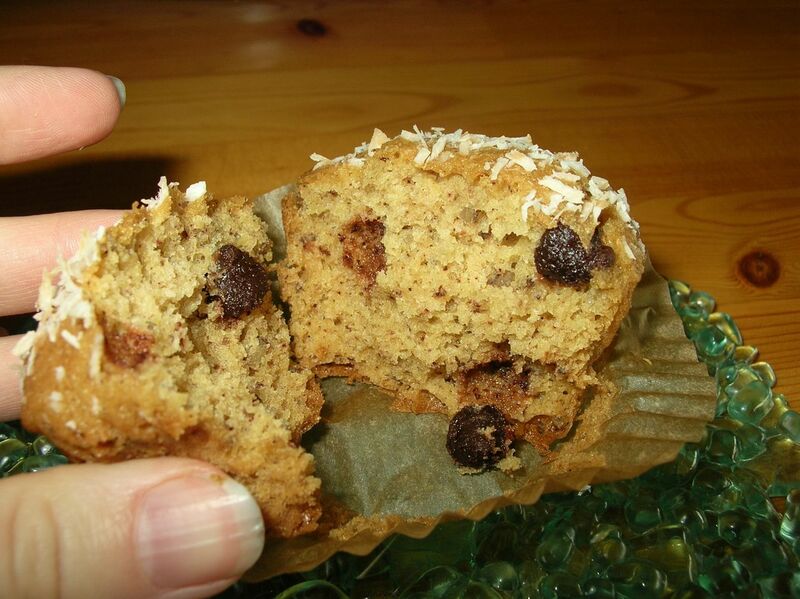 General comment about Namaste Gluten Free baking mixes: They're awesome. 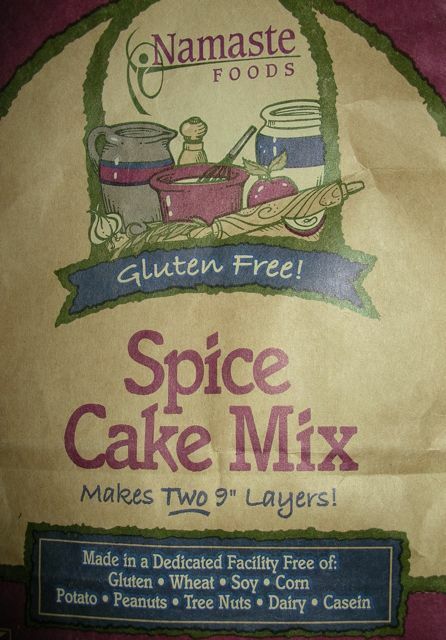 Some of you might have been excited when Betty Crocker came out with Gluten Free mixes. I have to say, I really wasn't. I'd already fallen in love with Namaste. They're made with quality, whole food ingredients. We also highly recommend their Gluten Free Pizza Crust Mix. Thought I'd show you all a recent finished object today. This is my rendition of Anne Hanson's Pea Vines Shawl. You can also view/buy this pattern directly on Ravelry. 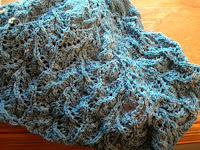 I have made the medium size shawl with Knitting Notions Merino/Bamboo in Azure. I had a little trouble - I only had one skein and it wasn't quite enough. But Katherine at Knitting Notions was very helpful in finding a skein of the same dye lot for me, and I was able to finish it with no modifications. Thanks bunches Katherine! The design is well presented and interesting work. The main body of the lace work with the little nupps creating 'peas' is a little complicated, so maybe not the best for your first lace, but if you're past that beginner stage and comfortable working from charts, it is a fairly straightforward pattern to follow. It also has written instructions, for those of you crazy enough to not like charts. I have three suggestions for you that might make the process easier. Cast on a sample by long tail. Note how many stitches wide your sample is for reference. Knit a bit. Check your gauge and they type of fabric produced. Carefully rip out, but when you get to the cast on edge, pinch the tail in your fingernails right where it joins the fabric edge and hold on. Rip out remaining stitches, leaving the slip knot in place. Without stretching or allowing sag in the yarn, measure the length of yarn between your fingernails and the loop. Divide this distance by the number of stitches used in the sample, then multiply by the number of stitches you plan to cast on, and add 10 or 20% of the distance, then measure out this distance on your yarn and tie a slip knot. Cast on. Rejoice that you only had to do it once. Second, I find nupps, at least the style Anne has used for this pattern, easier to create with a steel crochet hook, both for the making of loops and pulling through of the last. Try it - cuts down on the swearing. Third, as suggested by another Ravelry user, I stuck a T-pin under/at the base of each pair of peas during blocking (see photo), to encourage them to pop out a bit. For the medium size shawl, you're going to need a lot of pins for this, maybe 75 or 80. The last image is of the unblocked shawl. 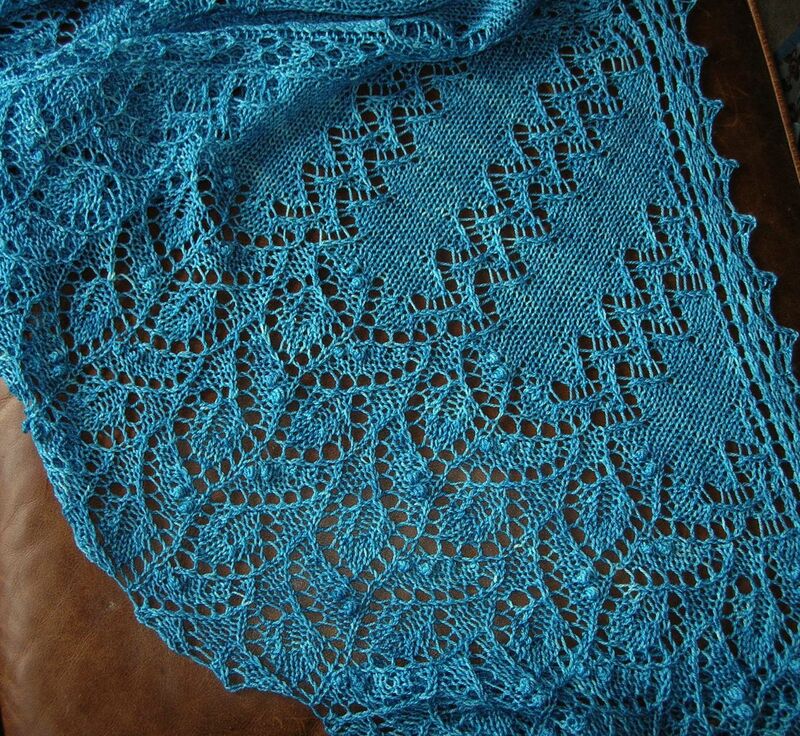 I remember hearing Kelley Petkun of Knit Picks saying in a podcast once that she would like to see more folks post images of their unblocked lace, so that the uninitiated to lace can see how different the final product looks from the in process item. See how scrunched up it is vs the photos posted at the top of this story? 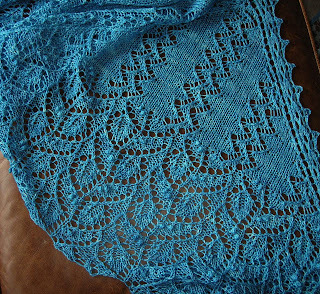 As you might guess, the blocking and stretching process also causes the shawl to grow considerably in size. She was shorn just before Christmas, below you can see exactly how poofy she was prior to her haircut. I haven't listed it on Etsy, but I could be talked out of her fleece. The clip was 4.5oz prime fiber this time. I was most gratified recently to get some lovely feedback from an equally lovely customer, Kate, in the form of two tempting photos and some comments on some of the roving I have available. Above, you'll see Kate's handspun made from the Coconut Truffle swirl roving. Doesn't her yarn look utterly squeezable and yummy?! I'm just a brand new spinner working with some really nice fiber. I must say that the [roving] is extremely easy to work with and we all liked the effect of the blend. I think using this provided the "ah-hah" moment I was waiting for - when it all pretty much started working the way it was supposed to. I'm just tickled to hear that she enjoyed it and even more excited to see the photos of her yarn. I have enjoyed my various conversations with Kate, as well, and hope to have many more. Thanks for your feedback Kate! Houndstooth is generally woven as two colors in a twill pattern, alternating groups of 4 threads of each color, creating sort of color drag across the fabric rather than discrete checks. In plain weave, which is the easiest and most typically used texture when weaving with a rigid heddle loom, you can make some thing very similar looking by using just a 2x2 check. Here are two scarves woven in just such a way. For my fellow crafters, I've included some commentary on the yarns used. Both were woven with a 10 dent heddle. Fabric is fabulously dense yet drapes luxuriously, and displays a slight aura from the Angora. It feels absolutely divine in hand. 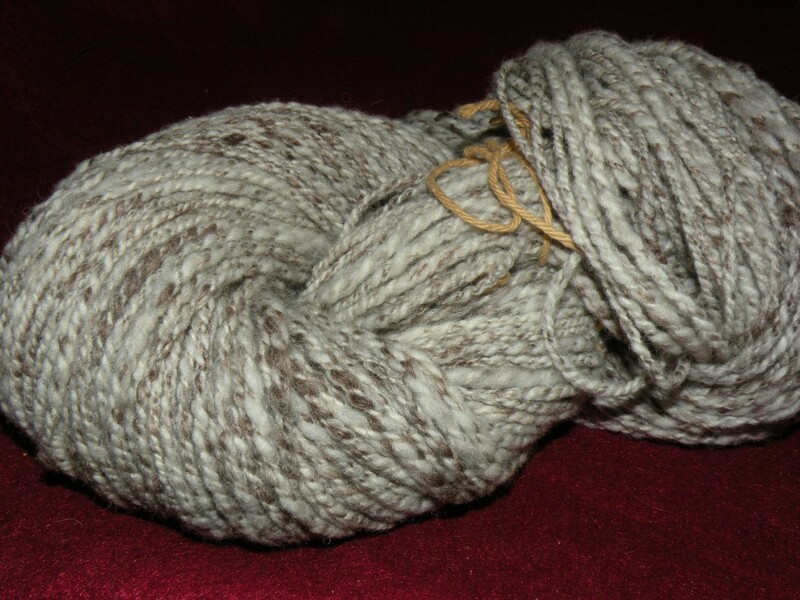 The yarn used here was Paton's Angora Bamboo. The yarn sheds a bit in handling, but not excessively so - it does have some angora in it, after all - and otherwise has a nice solid feel. It is ‘toothsome’, like al dente spaghetti, if you’ll forgive the comparison. However, of the 4 balls used, 2 had splices in the form of enormous knots, which would have had to be cut out even in knitting they were so bloated. It did not fuzz out as much as I expected with the angora, I suppose the bamboo keeps it in line mostly. Yarn held together nicely during washing, displaying no fraying, so the fringe was left loose. Please forgive my camera, it thinks this is far more toward red than it is in person. Actual color is closer to the color of a clementine's peel, perhaps a hint darker. The fabric has a comforting weight and smells pleasant due to the natural fragrance of silk. The yarns are neither soft nor scratchy nor slick. The feel is more..."rustic". It was woven with the idea of a solid but not overly insulating spring scarf, but may also be at home as a table runner. The yarns are slightly different in grist as well as texture, making the orange squares stand out a bit. It turned out very well. It was a delight to weave, both for the textural and color interest, and also for that lovely smell of silk. The yarns used were Svale Dale of Norway/Dalegarn (white) and Shibu Ella Rae (orange). I have knitted with the Dale of Norway, and it is of very 'splitty' cabled construction with very little give. It has poor twist and is rather stringy, in fact. 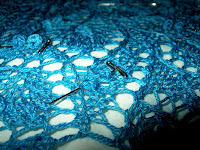 Weaving with it is fine, but due to the structure, or lack thereof, the fringe had to be twisted to prevent unraveling. By contrast, Ella Rae has nice construction, with a puffy rustic feel, and a lovely natural fragrance as it is 90% silk. I suspect it would be nice to knit with, though I have not tried. Loose ends unravel only slightly after washing. I very much liked weaving the 2x2 structure with the differently textured yarns, and would highly recommend trying it to all my weaving friends. It makes for a very interesting fabric. Here you'll find the exploits of my fanatical hobbies: Orchids, other plants, spinning and knitting.